Jurgen Klopp is ready to attack the final six weeks of Liverpool’s thrilling season and stressed his players ‘are on fire’ as they attempt to create history. Liverpool’s confidence is soaring after dramatic late wins against Tottenham and Southampton propelled them to the top of the league, having played a game more than Manchester City, and they are favourites to reach the Champions League semi-final. 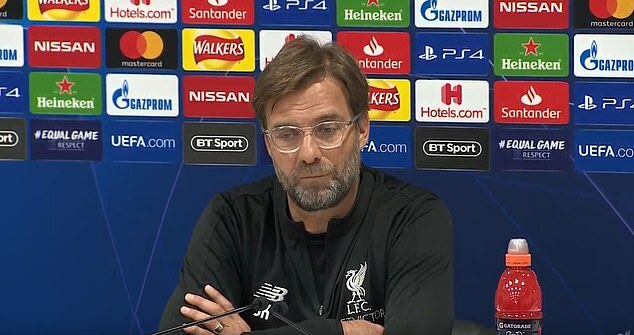 They host Porto on Tuesday night in the first leg of their quarter-final clash at Anfield – Liverpool beat the Portuguese team 5-0 on aggregate in the last 16 last season – and Klopp is getting the signals in training that the squad are ready for the challenge that is in front of them. Klopp, who has a squad that is almost at full strength, said: ‘It is such a good time. We get up every morning and the weather is good, which is not always the case. Klopp also has striker Mohamed Salah back on the goalscoring trail following his 50th goal for the club against Southamtpon. It ended a run of eight games without a goal for the Egyptian, but his manager insists the slight blip in form never had anyone at Anfield questioning his ability. ‘It felt already really good for him,’ said Klopp when asked about the 26-year-old’s goal at St Mary’s. ‘He was so close in so many moments and still now has 18 goals, 7 assists, so that’s a brilliant number. ‘So nobody was concerned. He is a grown man. He knows you have to work for it. So that’s why no one was concerned.